This post is by blog team member, Amy. Check out our team page to learn more about her! First of all, allow me to just be honest and admit that I do not love to go to the grocery store. As a matter of fact, it’s really quite the opposite. However, as a mom, wife, and health coach, my life is pretty much centered around my quest to feed my family well and keep them healthy while helping others do the same. So, careful and frequent grocery shopping is a necessity. While my search for shopping nirvana may never pan out, I am always thrilled when I find resources that make the process just a little bit easier. And that, my friends, is why, in addition to a wealth of great grocery destinations here in Charlotte, I. Love. Costco. 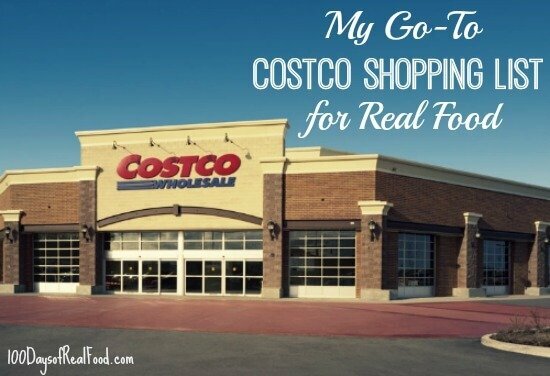 So today I’m going to share Part I of a two part series on my go-to Costco shopping list for real, healthy food, which will include produce, pantry staples, frozen organic veggies and fruit, organic meat options, and a few other tidbits. But first I am going to give you my short primer on shopping at Costco. First off, you have to buy a Costco membership, which consists of a yearly fee. There are different levels, and if you find you are a frequent Costco shopper, an upgraded membership is worth the extra money, in my opinion, because it earns you cash back. You might want to go walk around with a friend who is a member before taking the plunge. Costco will refund your membership if you are dissatisfied for any reason. They also have a return policy that is very convenient. All you need is the item and your membership card. Costco will have varied selection depending on where you live, including their organic food offerings, but they are responsive to customer demands. If you worry that bulk purchases are too large for your household, shop with a friend (or two) and split the goods. Make a shopping list and stick to it. Yes, there are always hundreds of ultra-tempting seasonal items, but if you had no plans to buy a stand-up paddle board this year, just walk away. While Costco tends to carry higher quality items, you still have to dissect food labels and ingredient lists – as with any food store. Costco is known for treating both its customers and its employees very very well. That goes a long way in my book. Apparently you can save more money at Costco by understanding their pricing codes. Google it. It’s fascinating. Kirkland Signature is Costco’s in-house brand. Now, onto the shopping. Part I will cover produce and pantry items including a couple real food rule benders that you might, occasionally (okay, often) find in my pantry. I’m starting with the produce section because I strongly believe that phytonutrients (plants) are key to good health and a long vital life. In my home, we go heavy on this food group by eating a variety of fruits and as many veggies, including leafy greens, as we can squeeze in. And in my health coaching, I encourage clients to “crowd out” (not eliminate) other food groups with this one. Costco has beautiful and bountiful produce. However, our local store, unlike others, does not carry a lot of organics, and while I do buy some non-organic produce items, I focus mostly on their organic salad greens. I am often freezing my extra spinach and kale for use in smoothies or to add to various sauces and other recipes. Their greens selection is especially handy when our gardens and farmers markets here are bare. 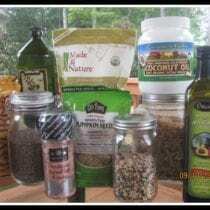 A well stocked pantry is another key to health and vitality, and mine is full of nutrient dense ingredients that I can throw into my culinary (I’m using that term very loosely) creations. Here I’ll provide some details on several of my favorites, some of which are not yet common in mainstream kitchens. We aren’t perfect. We maintain an average of about 80-85% whole/real foods in the Taylor household. It works for us, but we always strive to do even better. The following represents some of the imperfection within my pantry. So there ya go, Part I is complete (update: Part II of my Costco list is now complete as well). Don’t forget to download your free printable version of the Part I list using the button below. And as promised, here is my method for having perfect flavor-rich quinoa at the ready. I often double this amount and freeze it in servings of two and four. Rinse 3 cups of quinoa and allow time for the water to drain thoroughly. In a large sauce pan, toast quinoa over medium-high heat, stirring frequently, until quinoa makes popping sounds, about 5 to 7 minutes. Transfer quinoa to a bowl and set aside. Saute 3 cloves of garlic and 1/2 of a yellow onion in 2-3 tablespoons of avocado oil (or other) until softened. Add the quinoa to the mixture and stir until combined. Add 5 cups of organic vegetable or chicken stock. Bring to a boil. Turn heat down to simmer, cover, and cook for 13-15 minutes or until you see the little circles separating from the seeds. Salt and pepper to taste. I typically have a bowl on hand in the fridge and freeze what is left. Previous Post: « Homemade Ice Cream Cake! In addition to answering comments here on the blog, Amy is a mom, wife, health coach, earth lover, seeker, and wanderluster. She is the co-founder of Spunky Avocado where she passionately encourages followers to make choices that create a more peaceful, healthy, and sustainable world. I am really confused on whether Kirkland Cashews are real food/clean food. The ingredients list says cashews, salt, and peanut oil. Isn’t peanut oil refined? I would love some clarification on this and if these are the ones you are referring to on your Costco shopping list. Thanks! Hi Ella. No, Costco nuts are not perfect. I do buy them but now more often look for organic nuts with no added oils. In hind sight, I should have put them on the “cheats” list. Hi Ven. Ezekial bread is a great choice! Don’t forget real maple syrup. It is cheaper there unless you live in a area where they tap the trees, like Maine. I have been changing my diet slowly and have lost 40 lbs since September of 2014.Understanding my “mindless eating” and portion control has been key to my success. I’m writing this because I give myself “free” foods and my secret to filling up is using Eat Smart Sweet Kale 7 Superfoods Salad Kit minus the dressing. I use Chachies Mango Peach Salsa as dressing along with the Pumpkin Seeds and Cranberries. Sometimes I will add a few of the Kirkland Chicken Strips for protein. Well, I’ve never had that issue. Perhaps I need to look a little closer. :) Though, a quick peek at my spring mix looks bug free. Part of eating Kosher is checking vegetables for bugs. I’ve bought both the spring mix and spinach and although I cant remember for sure which one but I found a lot of tiny black bugs. So maybe check closer :) It is definitely very clean from dirt though…. Obviously there are more bugs because there are no pesticides used. Unfortunately it makes it harder for me to use because of the extra step of rewashing and checking for bugs , a very tedious job with the small pieces of spinach leaves and spring leaves, in that huge costco box. I just joined Costco and did a walk through first just to make sure, after reading your list from top to bottom as many of those same items I buy and was paying more for at a regular grocery store. Just wanted to say thank you, because your list helped me a great deal (both of them)! I am particularly excited about the frozen fruit. We fly through it and I really can’t believe how much cheaper it is there! Awe Jessy, that is so sweet! You are so welcome. :) I love the quality that Costco offers for the price. Just completed my first organic shopping trip at Sprouts. I did fairly well. Most everything is certified organic and fewer than 5 ingredients with the exception of the wine the gravy mix (10 ingredients)and the mushrooms (could not find any organic). However, I was so busy reading ingredients that I failed to see an expiration date and now must return one item. It was probably twice as expensive as I would normally spend, but I feel good about it. Some of these prices at Costco are really not that great of a deal at all. I shop at my local grocery store, Shoprite. And the pricing is MUCH cheaper. I also shop at my super Wal-Mart and again, the pricing is way better. Britt, are those the prices for Organic items at Wal-Mart? Because I’ve never had luck finding orgaic items there. I am making your quinoa recipe right now. I am excited to try it! What do you usually eat it with? I am hoping to have some different options for myself for lunch since I’m trying to cut out a little bit of bread. Thanks for some wonderful recipes! Aren’t you worried about the chemical “Bud Nip” that’s sprayed on non organic onions? 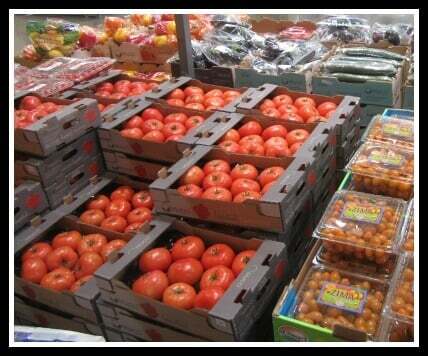 I really with Costco would start to carry more organic produce. Tomatoes and onions would be a great addition. Hi Kate. While I worry about any produce that I purchase that is not organic, I worry less if they are on the Clean 15 list:http://www.ewg.org/foodnews/clean_fifteen_list.php. But yes, I wish they would carry organic versions of all their produce. Can’t find the link for printable version of Costco-Part 1. Polar seltzer is a great Costco products. Four 6 packs of different flavored seltzer that sells for around $6.59. A great replacement for diet and regular sodas etc. I drink 3-4 a day. Has no calories and is filling when you feel a need for a snack! So, yes to Kind bars or no for you? I know they are in the rule-benders group, but I’ve seen other posts that say you don’t buy them. I go back and forth on them and recently stopped buying them….just wondering. What does the toasting of the quinoa do? Is it noticeable if you skip that step? I’ve been making quinoa for a long time but have never toasted it before cooking before. Hi there. I’ve cooked it both ways and prefer the flavor if I’ve toasted it first. I came across this post, which I found very helpful, while I was doing some research on Costco’s product list. I’m owner of a bakery in NY, and have always wanted to sell our product to Costco, but worry about the Costco customer not wanting to buy that product in bulk. I would love to get your thoughts on that. We sell All-Natural Pita Bread. No harmful preservatives or artificial flavors. Our mission is to always serve our customers the highest-quality pita bread ever made. But my concern is, whether the Costco consumer would buy Pita Bread in bulk. It would be greatly appreciated to get your thoughts on that! Hello. I honestly do not see why not. I have no real clue, though, as to how Costco decides specifically what it will sell. Best of luck. Hi! I too love the Eat Smart Sweet Kale 7 Superfoods Salad Kit, but the dressing is full of sugar. Can you share your recipe for the homemade dressing? Hi there. I just use varied vinegar and oil combos. Sometimes I use a citrus or champagne vinegar that is a bit sweeter. Other times, I add a little honey and mustard. I just wanted to say a huge thank you for this quinoa recipe! I just happen to run across it tonight and decided to make it. My kiddos (age 1 and 2 1/2) devoured it and my toddler is a very picky eater. One quick question on the directions it says to rinse and drain the quinoa. What is your recommended way to do this? Every strainer or colander I have had too big of holes. Hi Crystal. Glad you like it! :) I use a fine mesh strainer. A flour sifter can work, too. I add Turmeric, Cumin, Cardamon, Paprika, Italian Seasoning and a few Bay Leaves to give a little more flavor. I always have a bowl of Quinoa and a Bowl of Brown & Black wild rice. Thank you for you recipe. Most quinoa in a branded package has been rinsed. You only need to be wary of bulk. The package should say, or see the brand website. You can always test cook 1/4 c unrinsed and taste it for bitterness. This rinsing was only a concern when quinoa was new to the U.S. Ten years ago. Hello, I found Avocados at Costco yesterday for $3.99! So my question is, how do you store them to last the longest? Hi Cylinda, My dad grew avocados, so I’m all about eating them every day! Ripen on the counter, then stick in fridge. Mash on toast with salt. Slice on sandwiches, Make guacamole, and cover it completely with saran wrap. Will not turn brown if air can’t get to it. Cube in salads. Put a little in a green smoothie. You can get crazy and make avocado pie and avocado cake, like we did in 8th grade home arts. Good luck. pour salsa on top of quac. to keep it from browning. more environmentally friendly, better coverage and less expensive/wasteful than saran wrap. I refrigerate each one when it has the slightest bit of softness, except the one I want to use first. They can last up to a month. Can I have the recipe for your homemade recipe to go with that bagged kale salad mix at Costco pretty please? Hi! Thanks for a great list! I just have 2 comments. One is, why do you buy chicken stock? Throw a chicken or turkey carcass in your crock pot and let it simmer 24 hours. One of the easiest DIY recipes out there. I save my veggie scraps (carrot tops, onion ends etc) in a bag in the freezer and throw them in too! So good, and full of nutrition! My other comment is about the raw honey. Local raw honey has the pollen from all the local weeds and flowers. A little, like a teaspoon or honey stick, every day year round will slowly cure a person’s seasonal allergies, by getting their immune system used to the minute amounts of the allergens every day. It sure worked for my husband! The problem with raw honey at Costco is that it’s most likely not local honey. So not nearly as beneficial as getting raw honey from your local health food store or farmer’s marke . Hi. I do make my own stock but always have extra on hand just in case I can’t keep up with demand. :) My first choice for raw honey is from our local farmer’s market. And you can always, as I do, use just plain water. After cooking you can add any spice, salsa, or sauce you want. Hi Kitty. They have a good selection of organics in both locations. They have organic eggs and butter. :) The ground organic turkey is now a staple in my home, too. I need to do an update on this post! I love feeding my family healthy. I find that Costco doesn’t sell breads and nuts in their most digestable form(soaked or sprouted). 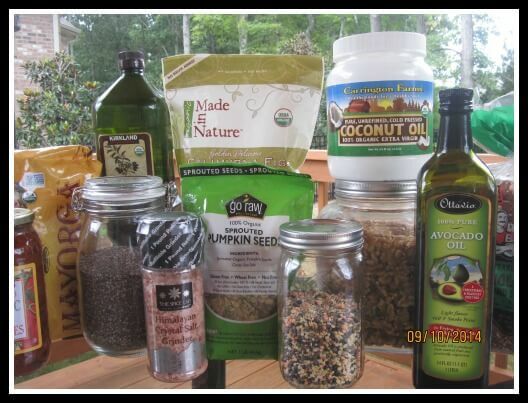 I find a huge difference in the way I feel when soaking my grains, legumes and nuts. Have you happened to come across any traditional prepared foods at Costco that maybe I have missed? Thanks! I am happy everytime I cook food for my family. I always wants that they will eat the food that is delicious and healthy. That’s why, when I discovered black seed oil. I add it up to every dish I make for them. We used it also as supplement. I also used black seed oil as a supplement and i can say that I gives me energy and strength to do my work as a wife. Do you find Cotsco is cheaper than buying several bags from Aldis?